This unit is OBSOLETE AND NO LONGER AVAILABLE. This high capacity, flow thru style humidifier is more reliable and easier to install and maintain than any other comparable brand. 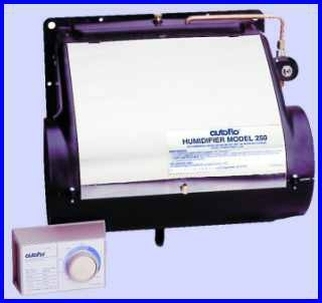 The model 250 can be used with any forced air furnace and mounted on either the warm air supply or the cold air return. This model humidifies your air with the bypass method, which forces air from the supply and pulls it into the return due to the pressure created in your furnace. The humidified air then mixes with the return air from your house and is forced back into your living area.